Crude oil futures were on the rise again Thursday, marking a sixth straight day of positive growth, according to Bloomberg MarketWatch. August West Texas Intermediate crude added 19 cents, or 0.4%, to settle at $44.93 a barrel on the New York Mercantile Exchange, marking its highest finish since June 13. August Brent crude, the global benchmark, rose 11 cents, or 0.2%, to end trading at $47.42 a barrel on the London ICE Futures Exchange. The August Brent crude contract ends with Friday’s settlement. Data from the U.S. Energy Information Administration on Wednesday showed that total domestic crude production fell by 100,000 barrels a day to 9.25 million barrels a day for the week ending June 23. 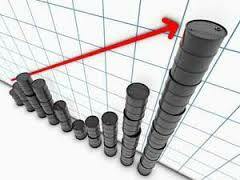 The EIA also reported that domestic crude supplies edged up by 100,000 barrels last week. That defied forecasts for a decline of 3.25 million barrels by analysts surveyed by S&P Global Platts. Natural gas futures ended lower with the August contract down 5.2 cents, or 1.7%, to settle at $3.042 per million British thermal units on the New York Mercantile Exchange.